Transform unknown web visitors into real sales opportunities. Leadexplorer gives you deep insights about the companies that visit your website and scores them based on how interested and engaged they are in your brand. Discover the companies with the biggest potential of becoming your customer. The leadscore is a clear indication of how interested a company is in your business and when it’s time for you to contact them. You get all relevant info you need to really get to know your leads, such as company info, interests and engagement. 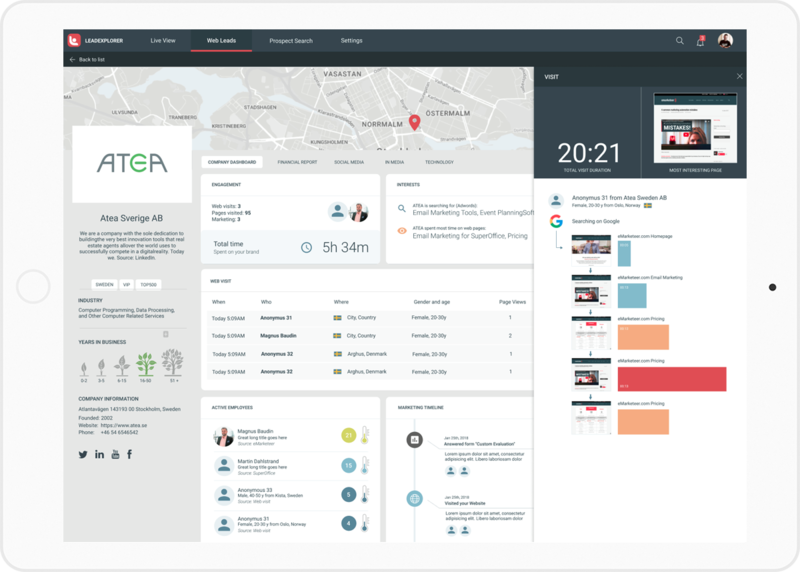 Marketing engagement and CRM insights; Leadexplorer collects and presents them both to give you a 360° view of your web visitors. Leadexplorer identifies the companies that visited your site. It also tells you what they're interested in along with other important company information. All you have to do to get started is to connect Leadexplorer to your Google Analytics account. 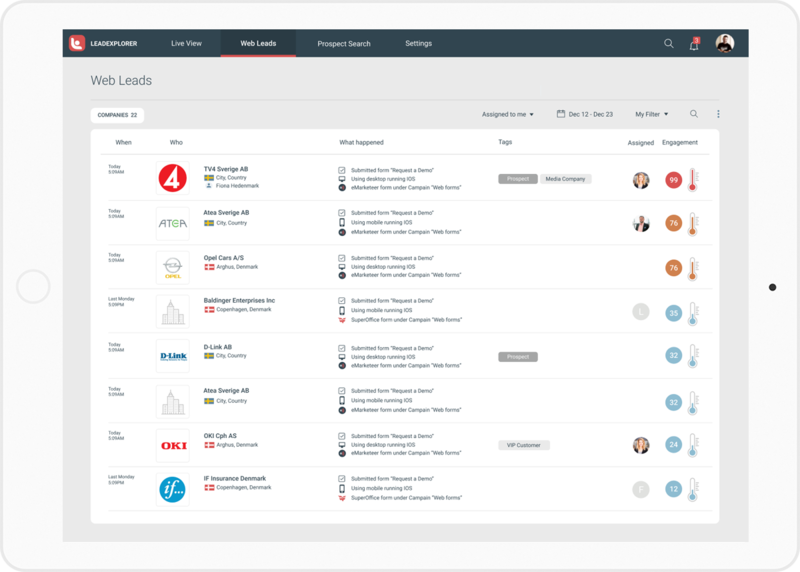 After that, Leadexplorer will start serving you B2B leads. Don't believe it? Try it! On the menu - freshly served leads! 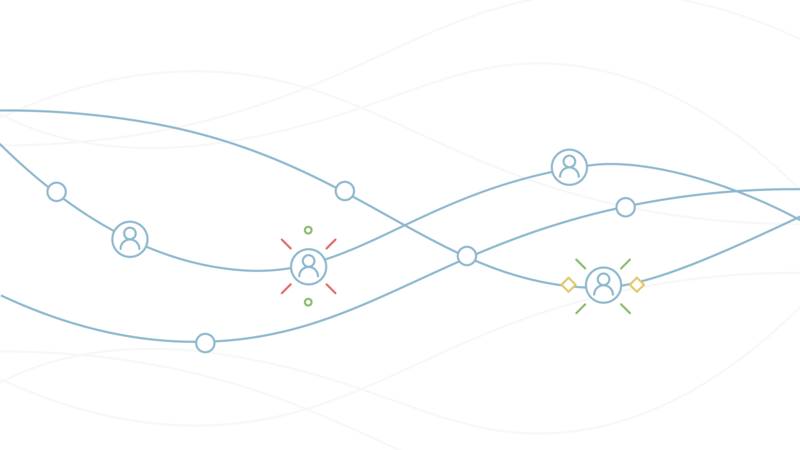 The web leads list shows every company that visited your site. You learn how they found your site and how interested they are in your business. Furthermore, you can sort the list by using filters and time periods to only show the leads that you’re interested in. Leadexplorer enriches the company profile with data from multiple sources. Hence, it magically presents all information you need to really get to know your leads. 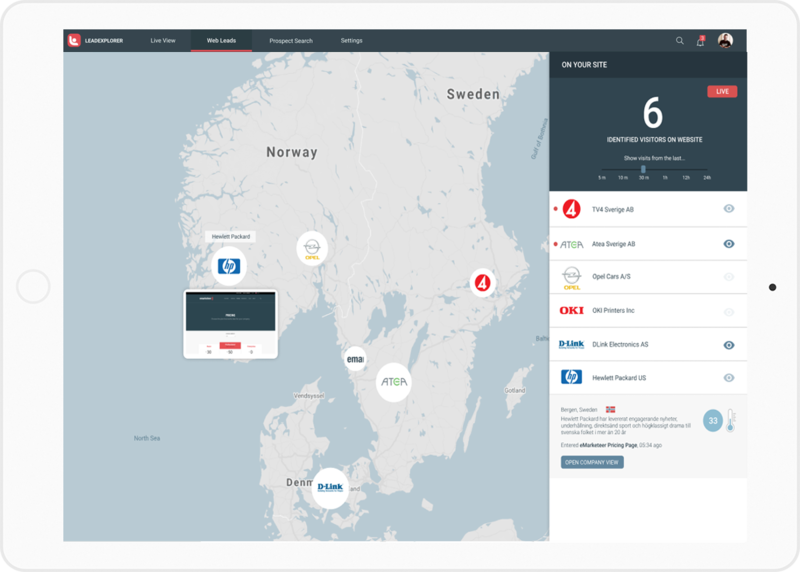 Live View shows you which companies are on your site right this moment. Head over there when you send an email to see how much traffic it generates in real-time, or screen share it to your office TV and have all your colleagues involved in what goes on on your website right now. Leadexplorer is a tool created by eMarketeer. eMarketeer has done website tracking for more than 10 years. Where other see just traffic, we see sales opportunities.